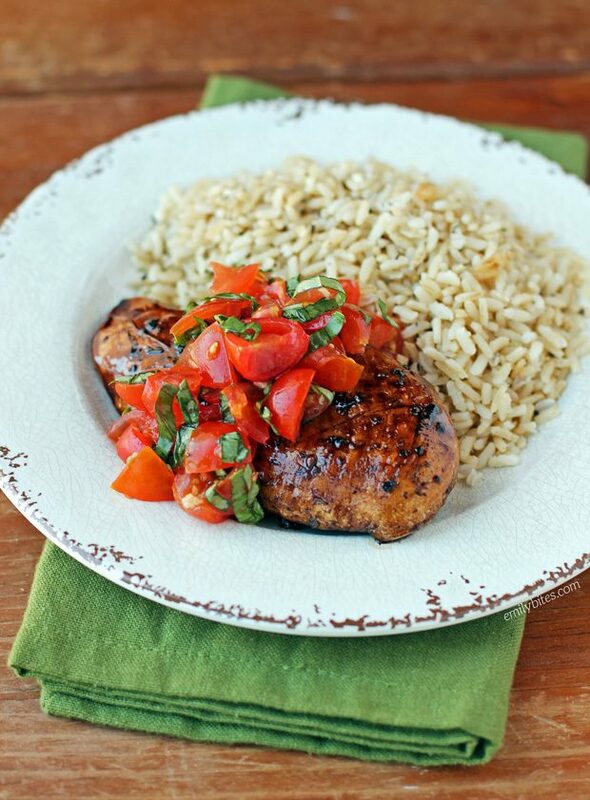 This Bruschetta Topped Balsamic Chicken looks and feels fancy, but it’s deceptively simple. Perfect for date night, a dinner party or just a cozy night at home! 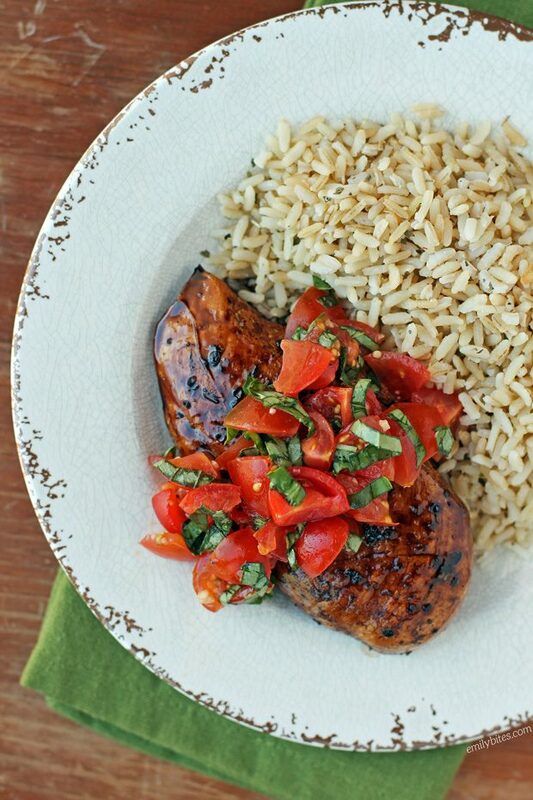 The balsamic glaze on the chicken is sweet and tangy and it pairs perfectly with fresh tomato, basil and garlic bruschetta-style topping. This chicken would be great served with roasted veggies, pasta, salad, potatoes, rice or almost any of your other favorite side dishes. Not only is it packed with flavor, each serving is also just 293 calories or 4 Weight Watchers SmartPoints! Looking for more delicious lightened-up chicken recipes? Try my Cheesy Bacon BBQ Chicken, Cream Cheese Stuffed Everything Chicken, Antipasto Chicken Roulades, Pimento Cheese Stuffed Chicken, Mediterranean Topped Grilled Chicken, Chicken Cordon Bleu, Chicken Milanese with Spinach and Burst Tomatoes, Lemon Pepper Iced Tea Chicken, Pizza Chicken Roulades, Thai Chicken Skewers with Peanut Sauce, Chicken Piccata and many more in the Chicken section of my recipe index! Pre-heat the oven to 400 degrees. Place the chicken breasts on a cutting board and if necessary, pound with a meat mallet to ensure an even thickness. Sprinkle each breast with salt, pepper and oregano on each side. Pour 1 ½ teaspoons of olive oil into a large skillet and bring over medium-high heat. Place the breasts in the pan in a single layer and cook for 1-2 minutes on each side to lightly brown the outside of the chicken. Mist a baking sheet with cooking spray and place the chicken breasts onto the sheet. Cover with aluminum foil and bake for 15 minutes. While the chicken is baking, combine the balsamic vinegar, sugar and salt in a small saucepan and stir to combine. Bring to a boil over medium-high heat and then reduce the heat to medium low. Simmer for 10-15 minutes until the mixture has reduced and thickened and will coat the back of a spoon. Split the balsamic glaze into two small dishes. When the chicken comes out of the oven, discard any extra liquid produced by the chicken. Use a pastry brush to brush the glaze from one of the dishes onto the chicken breasts. Place the baking sheet of chicken back in the oven, uncovered this time, for 5-10 minutes until the chicken is cooked through. Wash your pastry brush thoroughly. Combine the chopped tomatoes, sliced basil, minced garlic and the remaining ½ teaspoon of olive oil in a bowl and add salt and pepper to taste. Stir to combine. When the chicken breasts are done cooking, brush the second dish of balsamic glaze over the chicken breasts. Serve each breast topped with ¼ cup of the bruschetta tomato mixture. Just made this tonite & my husband loved it! We can’t wait to make it again this summer with our home grown tomatoes. Made this tonight. It was Delicious!!! Thanks Emily!